Located on the east side of the north eastern peninsular of Koh Samui, Choeng Mon villas are considered to be located in one of the best areas for a choice of Koh Samui villas. It has something to offer every member of the family. Located on the east side of the north eastern peninsular of Koh Samui, Choeng Mon is considered one of the best areas for a choice of Koh Samui villas, where it has something to offer for every member of the family. Considered more upmarket than it’s neighbours of Plai Laem and Big Buddha, the area takes up Choeng Mon beach as well as the two smaller bays of Tongson and Tongsai. 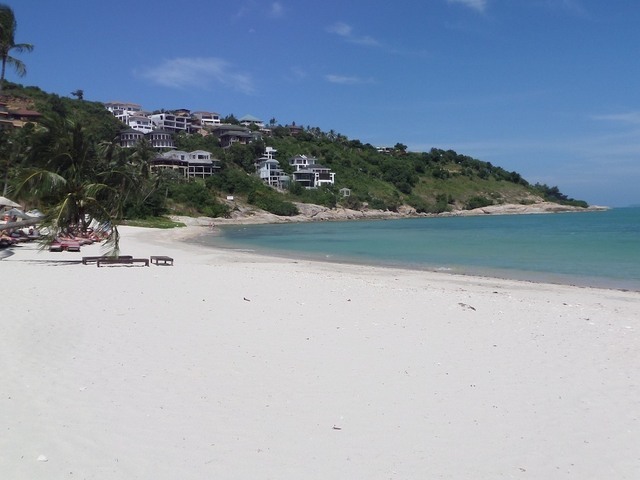 The main Choeng Mon beach itself is rated as one of the finest beaches on Koh Samui, with the long curvaceous bay and clear waters forming the perfect swimming beach. This beach was kept secret up until 10 years ago, mainly used by the long term residents of Koh Samui and their families, it's centrally located. Access to the beach is via various routes leading from the village and many tourists could pass through the village completely unaware this beautiful beach was yards away down some dirt tracks. All this has now changed, since there are now two 5 star hotels at either end of the beach and developments of luxury ocean view villas now exist in the hills beyond. In high season instead of 2 rows of sun loungers in front of the restaurants, there are now 4! 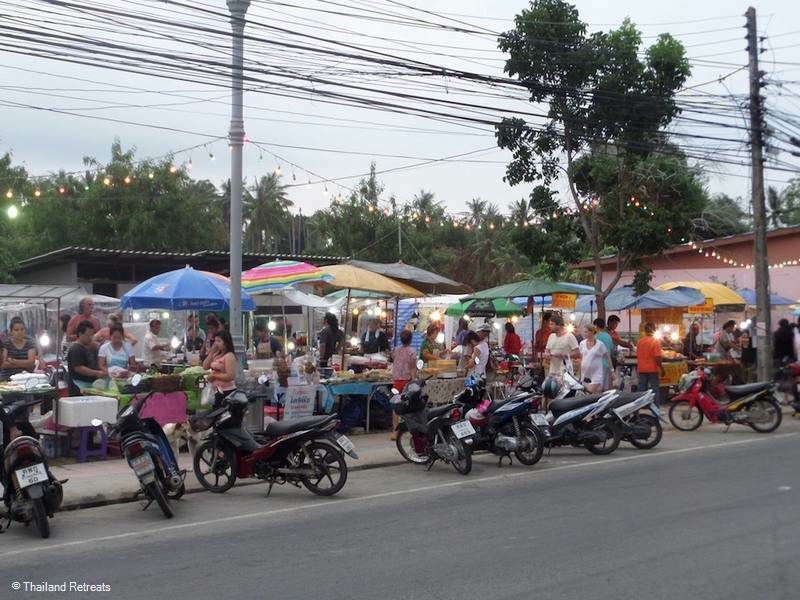 There is a pleasant ambience in Choeng Mon village, the area has been lifted with the introduction of a ‘walking street’ market on a Wednesday evening focused around the Muang Samui 5 star Resort. The street market is nowhere as big as the main walking street at Fisherman’s village, but still has many stalls set up by the locals which include a fruit carving demonstration as well as other crafts, jewellery, food stalls, T-shirts and beachwear, plus entertainment in the form of music and Thai dancers. A great evening out. The village is small but still has the usual amenities of banks, convenience stores, pharmacies, tour shops and a few souvenir shops and there are a number of off beach restaurants to choose from. The beach is in a sheltered bay with soft white sand and shallow waters, making it a perfect beach for families with swimming all year round and activities on the sands. 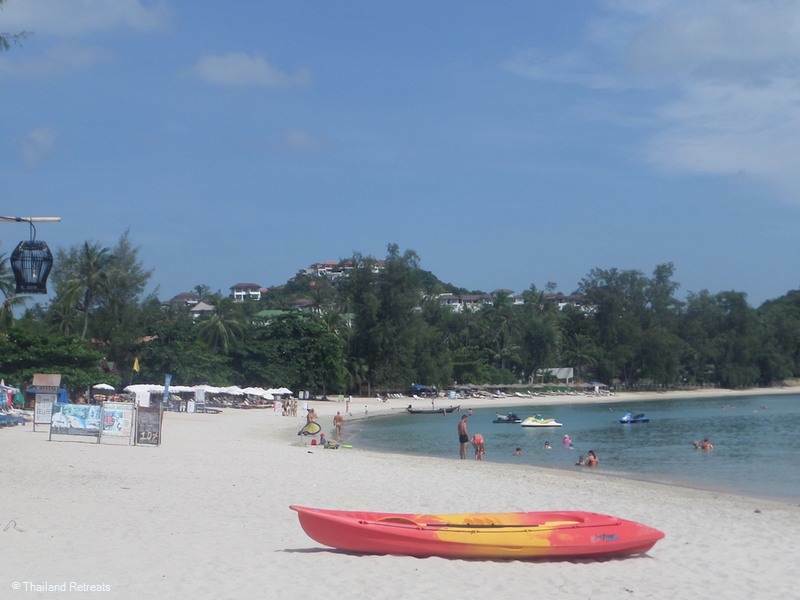 It is bordered by high to mid range resorts, with Thai style restaurants in between offering complimentary sunbeds with the purchase of food and beverage. 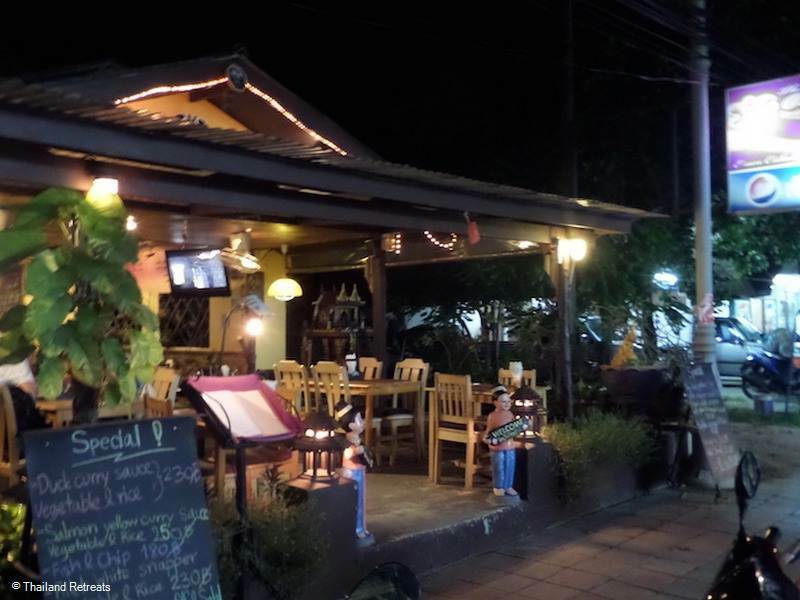 These restaurants mainly take up the central part of the beach and are very popular with the tourists, a great spot to come and spend the day from other areas of Koh Samui. At the east end of the beach overhanging trees form some shade for families who just want to sit on the beach and have a swim. At this end there is a small islet Koh Fan Noi which can be reached by a sandbar at low tides to explore. At the west end is the 5 star Sala Samui which actually has a public walkway through the centre of it (although not displayed) and this is a useful access for the holidaymakers resident in the luxury ocean view villas located nearby. 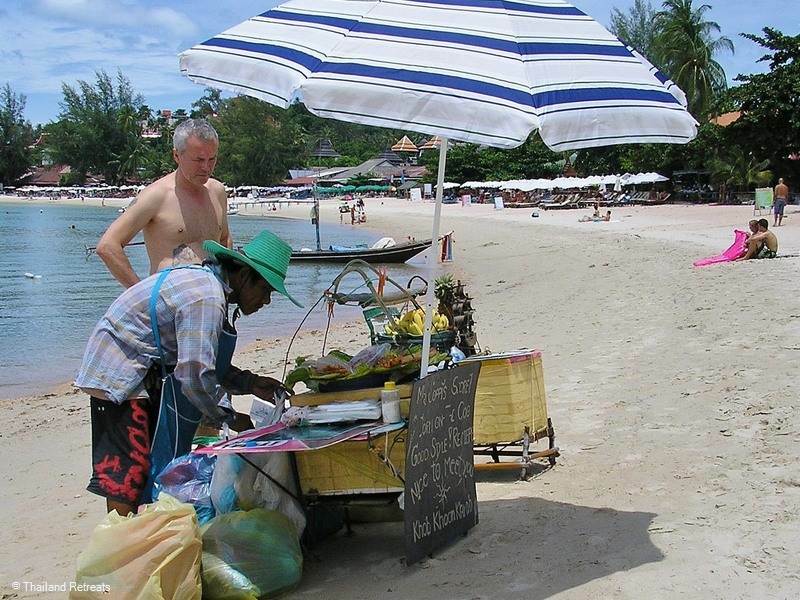 In the high season as with all the beaches it gets very busy and where there are people there are beach vendors including portable kitchens, jewellery, clothing and beachwear. 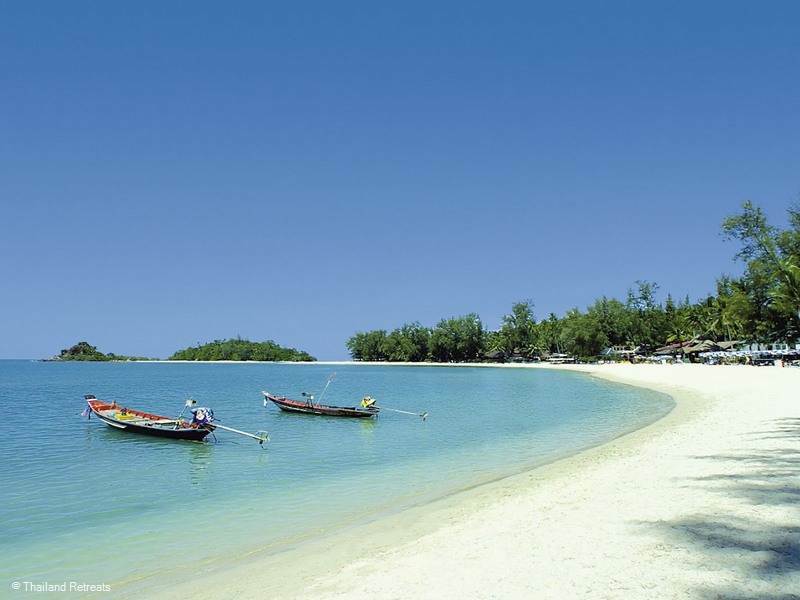 This beach is stunning and another secret beach, it's accessed down a meandering road leading from the Plai Laem road. 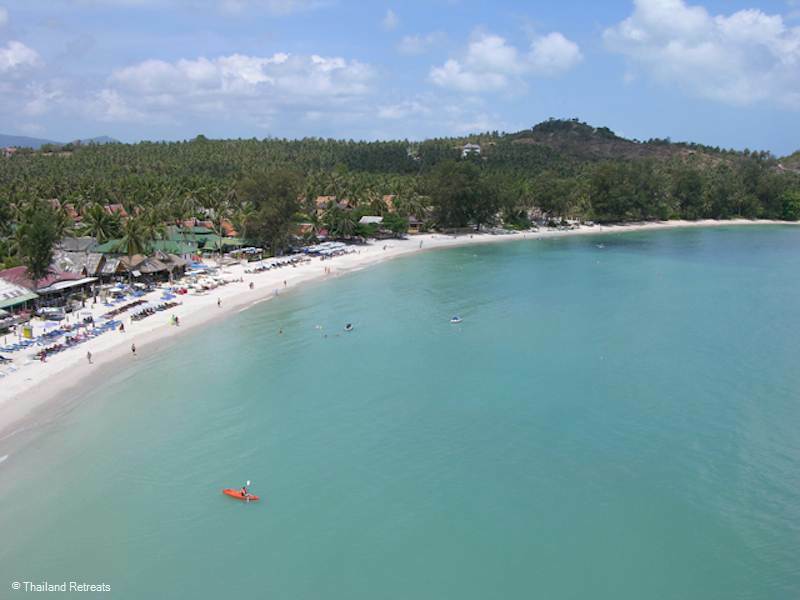 At the bottom there is a large parking area and a Thai style restaurant which shares the beach with a mid range hotel, a small bungalow resort and a villa resort. 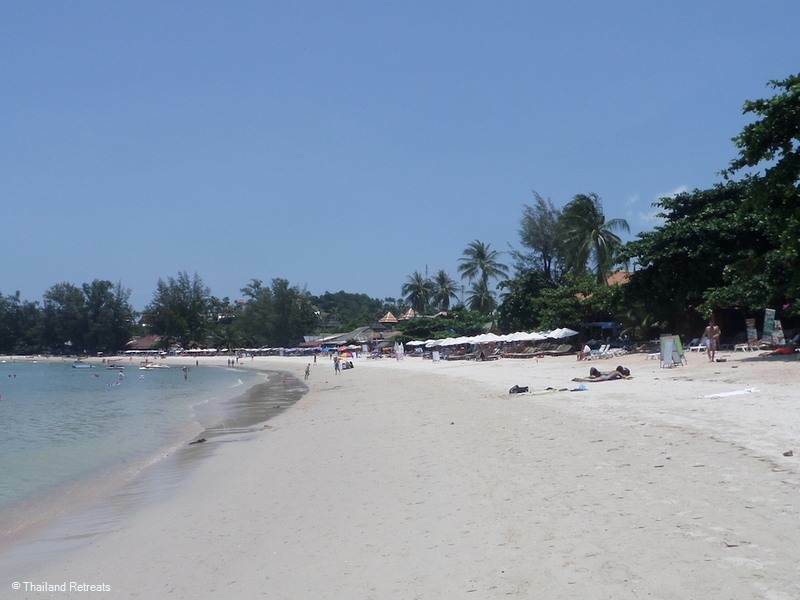 Tongson Bay is a quiet sandy beach with no vendors in a sheltered bay. At the east end of the beach it is quite rocky, but rock pools create some interest for kiddies. The restaurant at the Melati Hotel provides another dining option. To visit this beach it is only possible if you check into the Tongsai Bay Hotel or access it by boat, as this long established hotel targeted at honeymooners considers it their own private beach . As Choeng Mon is centred around the beach, you will find most of the spa and beauty treatments are offered by the hotels within the area. One of the newest resorts to open with a spa that has an unusual set up and is quite an experience. The treatment rooms are a set of caves that have been built beside the pool and the beach. North East - A beautiful sandy bay that could easily be missed when driving round the island. This is an ideal family beach lined with small bamboo restaurants, sun loungers and umbrellas and can be reached through short tracks from the main village. 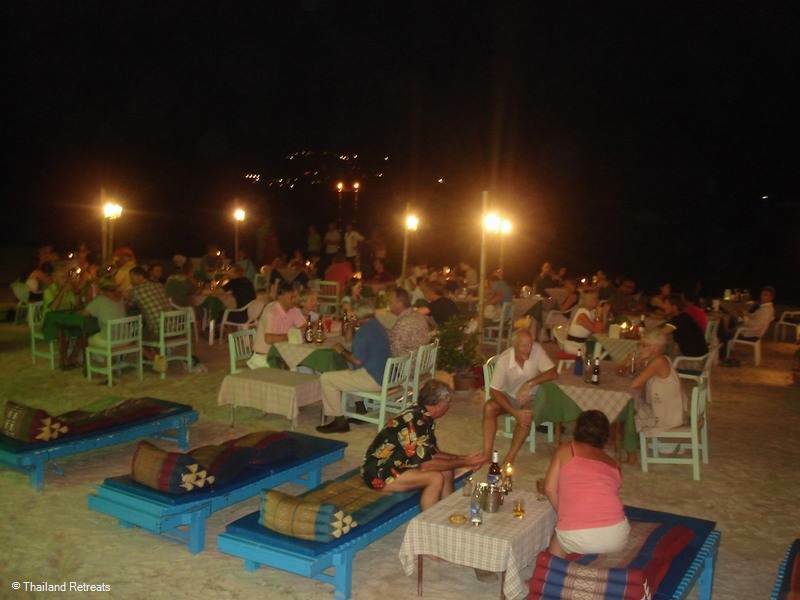 There are several restaurants to choose from which are located on the beach and in Choeng Mon village. However you will find that the there is quite a western choice of meals targeting the tourists from Europe who enjoy this area. Crystals, one of the family run rustic Thai restaurants is located on the beach towards the centre of the bay and provides good value meals throughout the day in the open sided restaurant. Evening dining is also popular, with tables set up on the beach and occasional entertainment in the form of Thai dancing. The Orchid restaurant proves very popular, an excellent comprehensive menu serving good value food and has many returning tourists. The restaurant at the well established Sala Samui Hotel is the place to go for high end cuisine. That is located at the north end of the bay, it's casual but classy, set alongside the beach and pool. The main restaurant easily accommodates large groups if booked early enough, as well as being the perfect setting for couples seeking that romantic touch with a table on the beach, a low lit ambience and the sound of lapping waves. As there are no hostess bars in Choeng Mon (by order of the local village headman) the night life is limited to relaxing with a cocktail on the beach after dinner. However there are one or two sports bars in the village, although nothing is open late.